The AutoCAD training materials bundle includes all of the materials needed to improve your existing skills in the industry standardsoftware related to AutoCAD. 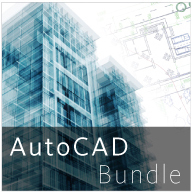 The bundle includes courseware for AutoCAD Level I, AutoCAD Level II, AutoCAD Update and Raster Design. The AutoCAD training materials bundle includes all of the materials needed to improve your existing skills in the industry standardsoftware related to AutoCAD. The bundle includes courseware for AutoCAD Level I 2017, AutoCAD Level II 2017, AutoCAD Update 2017 and Raster Design 2017. Includes a 175-page online manual, 17 exercises and 20 instructional videos. This online training manual was designed as an introductory course and is recommended for users of all AutoCAD-based products. The course emphasizes fundamental 2D drafting skills. Develop a comfortability with the AutoCAD environment. Through the use of our highly-evolved online course materials, videos and hands-on exercises, this self-paced manual will help develop the necessary skills for efficient and accurate drafting. Recommended prerequisites: None. Drawing setup, units and scale, object creation and editing functions, display and zoom functions, advanced drawing functions including 2d polylines and arrays, hatching, query tools, layer creation and management, text, dimensions, precision drafting with object snaps, blocks, dimensioning, the Cartesian coordinate system, relative coordinates, coordinate precision, and more. Includes a 196-page online manual, 4 exercises, and 25 instructional videos. This online training manual was designed for users who have completed AutoCAD Level I and for existing users who wish to improve their AutoCAD skills. Course emphasizes plotting and managing drawings. Learn the commands that all experienced AutoCAD users should know and understand. Attain an understanding of AutoCAD’s method of project collaboration. Learn the workflow of AutoCAD’s plotting process. Recommended prerequisites: AutoCAD Level I. Advanced environment topics including external references, drawing file management, paper space, page setups, viewports, plotting, publishing, PDFs, DWFs, raster images, tables, text from Microsoft Word, line types, user coordinate systems, annotative objects, fields, design center, data extraction, dynamic blocks, and etransmit. Includes a 168-page online manual and 10 instructional videos. This online training manual is recommended for AutoCAD-based users who are migrating from an older version to a newer version of AutoCAD. Users transitioning from previous versions will learn new AutoCAD features and productivity enhancements included in the latest release and a couple of releases back. Recommended prerequisites: Prior knowledge of previous versions of AutoCAD. Interface changes, associative arrays, parametric constraints, selection and grip improvements, PDF improvements, annotation changes, online functionality, and other often overlooked command updates that will enhance productivity. This course does not include 3D solid modeling.